In March 2018 Vladimir Putin won a fourth term as president of Russia, gaining 77% of the vote. Nationalistic sentiment has risen since the outbreak of the Ukraine crisis and the annexation of Crimea, supported by aggressive propaganda through the state-controlled media. Playing the nationalist card, especially in relation to the EU and the US, appears to be the key to keeping approval ratings up. and restrictions on the export of certain types of products to Russia, including dual-use technologies and high-tech equipment for the oil industry. Russia itself imposed retaliatory sanctions on the import of food and agricultural products from the EU, the US, Australia, Canada and Norway. In March 2018 tensions increased further after the alleged nerve gas attack by the Russian secret service on a former spy in the UK, leading to additional sanctions imposed by the UK and the US in 2018. 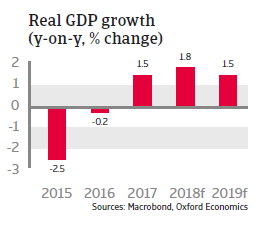 Annual GDP grew again in 2017 after two years of contraction, and the recovery is set to continue in 2018 and 2019, mainly based on the rebound in oil prices and stronger domestic demand. However, structural weaknesses and the negative impact of sanctions on productivity and investment continue to weigh on economic expansion. Major short-term downside risks to the growth outlook are increased exchange rate volatility and rising inflation in the wake of further rising geopolitical tensions and the newly imposed sanctions. In August 2018 the US imposed additional sanctions as a reaction to the nerve gas incident in the UK, including a ban on exports to Russia of security-sensitive goods and technology, and more sanctions like increased curbs on trade are looming. 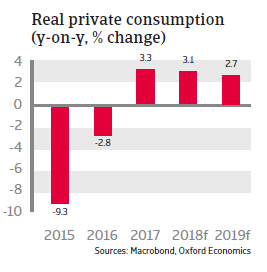 Private consumption growth is likely to remain robust in the coming months, driven by higher consumer confidence and a lower inflation rate boosting real disposable income. 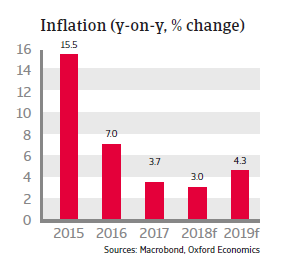 Russia has seen a steady decline in consumer price inflation since late 2015, which allowed the Central Bank to cut its main policy rate several times, to 7.25%. 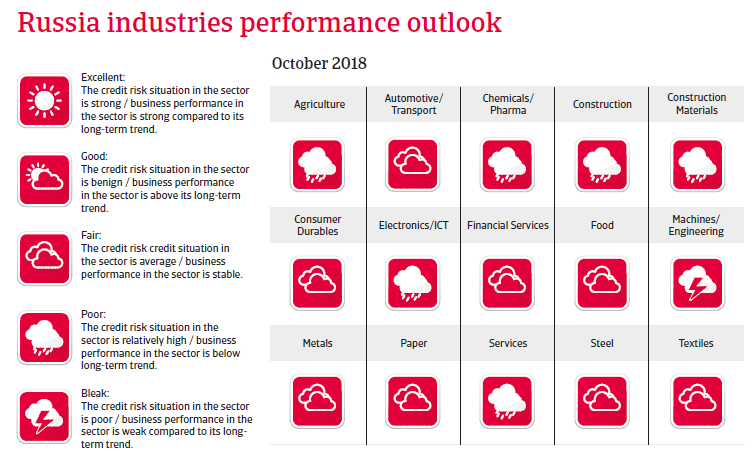 Further monetary easing to support growth is expected in the mid-term. 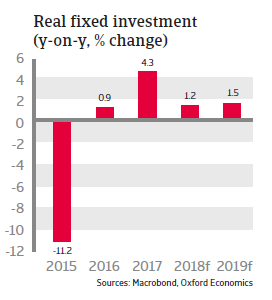 However, real fixed investment growth is expected to remain subdued in 2018 and 2019 due to the high level of perceived risk, red tape and a weak institutional backdrop. 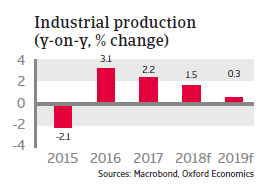 The Russian banking sector has slowly recovered in 2017 and H1 of 2018 and the Central Bank’s interventions to bail out Otkritie and B&N bank have prevented a systemic crisis. However, the launch of new US sanctions against Russian oligarchs and their companies threatens to derail the recovery, through uncertainty and lower investment. The EU/US sanctions may have a very significant mid- and long-term impact on the refinancing capacity of major domestic corporations and banks. The Central bank allows the rouble to float. This has an impact on inflation if the currency depreciates, but also acts as a shock absorber for the current account, which is expected to remain in surplus in 2018 and 2019. At the same time, the fairly large international reserve position of Russia hardly erodes as capital outflows are contained. Russia´s short-term economic policy during the previous recession has been rather prudent. Despite very low public debt of about 12% of GDP and pressure from low oil prices on the budget, the government deficit has been kept within acceptable margins. In order to shore up state finances for higher social spending in the coming years the government plans to increase the value-added tax from 18% to 20% as of January 2019 and has raised the pension age. The government has confirmed its plans to balance the budget by 2020, using a fixed USD 40 per barrel oil price. Any extra revenue generated by a higher oil price will be used to intervene in the currency market and to further build up currency reserves. This build-up of foreign reserves is allowing Russia to avoid reliance on borrowing and to pursue a more independent economic policy. 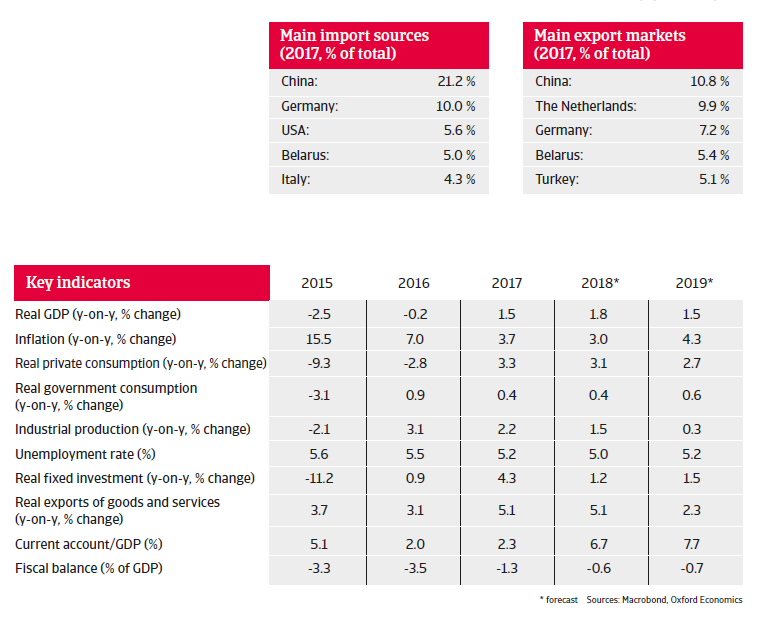 The Russian business climate is mired in uncertainty regarding property rights, a weak transport infrastructure and lack of competition in goods and services markets. The authorities failed to seize the opportunity during the windfall years to strengthen Russia’s economic structure and enhance its non-oil potential by prudently investing high oil revenues in other industries to diversify the economy away from the dominant oil and gas sector.